Your phone rings and someone says, "Hello, my name’s Mark. I’m with Financial Solutions International. We offer a broad array of financial solutions. Do you have a few minutes? Probably something like this: "Uh-oh, another salesperson. I’m about to be sold something. How fast can I get this person off the phone? I call it "The Wall. Here’s an example based on my own experience. I offer Unlock The Game™ as a new approach in selling. When I call a vice president of sales, I would never start out with, "Hi, my name is Ari, I'm with Unlock The Game, and I offer the newest technique in selling, and I wonder if you have a few minutes to talk now. The key here is never to assume beforehand that your prospect should buy what you have to offer, even if they’re a 100 percent fit with t,he profile of the "perfect customer." 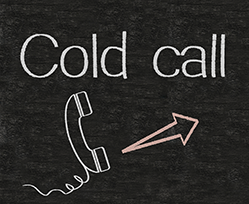 Here’s a step that most people miss when they cold call. As soon as they realize that prospects have a need for their solution, they start thinking, "Great, that means they’re interested. What they don’t ask is, "Is this need a top priority for you or your organization to solve, or is it something that’s on the back burner for a while? It came from someone making a call, getting rejected, and the boss saying, "Call someone else.